K&N was founded in 1964 with its headquarters in Riverside, California, and is recognized as the "Best engine air filter in the world". + K&N air filter does not take down the wind pressure pressure, helps the fuel burn out and maximize the capacity according to the design capacity. + K&N air filter has created from 4-6 layers of cotton fabric sandwiched between 2 layers of aluminum mesh and soaked with special oil so the filter can be cleaned and reused. + Filter warranty period of 1.6 million km. 1. Needs much more frequent routine maintenance (cleaning and re-oiling) than the stock paper filters. 2. A clogged K&N can and will cause running issues with at least some cars. I know this from experience with a 3.2/Motronic. 4. The oil used on the K&N can cause problems with hot wire AFM’s. The manufacturers (Porsche and others) devote a good bit of engineering time into the intake systems, including the air filters and housings. Although they may not sound or look “cool,” why try to improve it. If you're giving away free samples I'll take one. I let the KN I had on my BMW bike get hard and it didn't seal properly and the bore hatchmarks got wiped out so I only use OEM on my bikes now. My 911 has a KN and its still soft and pliable so I'll keep it. I shudder whenever I see a K&N filter on a car as I know the intake will have a coating of fine grit on the inside. I'd rather forego the couple hp for the longer engine life a OEM paper filter gives me. Last edited by Peter M; 04-09-2019 at 11:17 PM.. Truth for anyone that takes stuff apart, but if you're a check writer, no worries. I have used K&N for years. Down wind side is alway spotless. Some of our Cat marine engines are supplied with K&N style filters... it is suggested that they are replaced after every third cleaning. As have I (for around 30 years), on competition motorcycles, grocery getters, 7.3L diesel engined box truck, 914s, my Turbo, etc., and never once found dirt or grit on the intake side of the filter. And I'm a mechanic that does all my own work, so no "check writer" here. Regardless, that's definitely a funny spam post from a first-time poster! Last edited by Rawknees'Turbo; 04-11-2019 at 10:26 PM.. There are now dry and reusable filters now being touted. Even the venerable K&N company has a version. In my recent transplant into my '69, the factory 3.2 airbox interferes with portions of the fuel system and oil filter, thus needed a viable option. I looked for the largest filter to fit into the available space. The passenger side engine lid hinge posed an issue with a horizontally mounted filter, so I ended up sourcing a 12" high, AEM cone filter, AF meter adapter, silicone hose elbow and clamps and came up with this squeeze job. The reddish filter material is partially masked by a pre-filter. After rerouting existing oil tank lines, there's no more room. I never understood the point of this. What I mean is... why hasn't anyone made a proper air filter that pulls air from the outside??? It may seem silly, but imagine how much better an engine you could have if you collected air from the top of the engine hood? I've thought about designing something that uses a square style air filter attached to a box at the grill vent of the engine hood. That way it pulls in cold air from outside the engine bay. In an air-cooled Porsche, there is no such thing as cold air intake, unless the ambient air is...... cold. Several people (including me) have measured the air temp in the engine compartment (and factory airbox) during vehicle operating conditions compared with ambient air temperature. The volume of air pushed in by air pressure and/or drawn in by the engine cooling fan surprisingly results in little to no air temperature difference. YMMV with vehicles with a large underhood coolant radiator in the air intake path. IMHO, the term "cold air intake" is largely a marketing ploy, at least for air-cooled Porsches. I mounted the filter away from the grill opening to reduce ingesting rain and wash water (yeah, there's some of the former in So. Cal). I've seen installs with a 90º elbow that points the filter in a fore/aft direction. I felt that strategy exposes the filter to increased water ingestion. The exception to this is if running A/C. The air being pulled in by the fan is heated as it removes heat from the condenser. Routing "outside" air directly into the intake while maintaining full flow of air across the condenser is a challenge. It's not a Carrera.... It's a Super Carrera! Quite accurate. 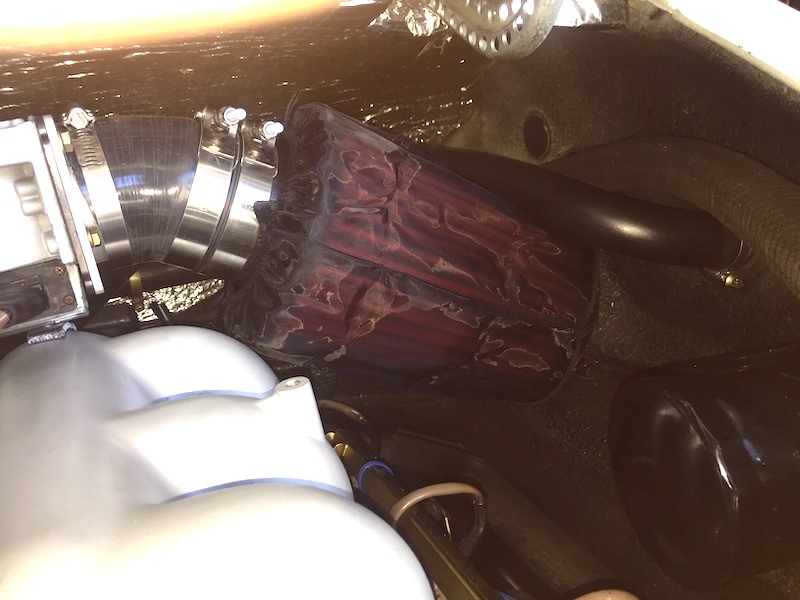 During A/C operation, most, if not all of the air passing into the engine compartment is heated by the condenser. 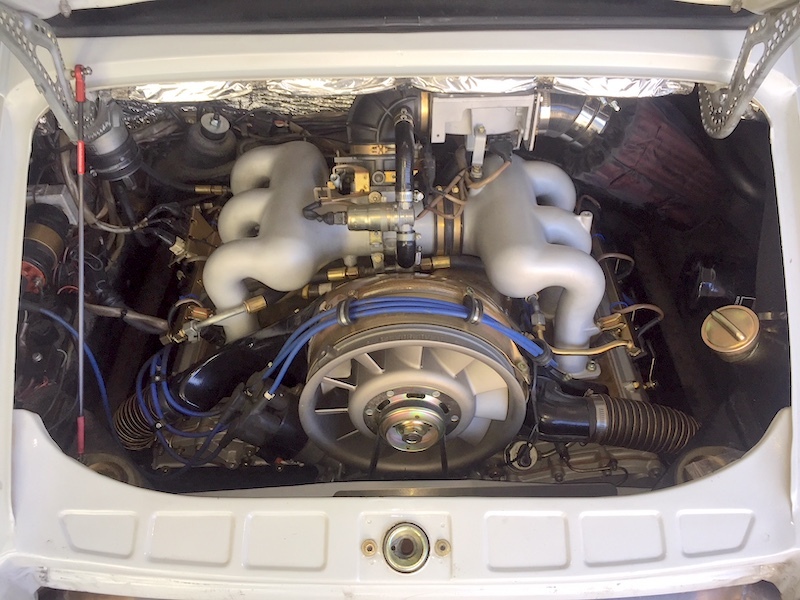 It's in a compromised location for an air-cooled engine, but A/C was initially an afterthought for early 911s and thus all the equipment was fitted under a space-available basis. I don’t see many issues with well oiled and good fitting K&N filters. But the ones that I’ve noticed down stream dirt; they don’t fit the air box well or are counterfeit I suspect.